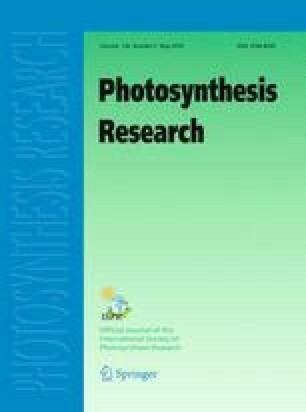 When grown at intermittent light regime, diatom alga Phaeodactylum tricornutum is able to form photoprotective non-photochemical chlorophyll fluorescence quenching (NPQ) three to five times larger than that observed in the higher plants. This quenching is sustained in the dark for 5 to 10 min, reverses completely within approximately 1 h and seems to be very tightly related to the presence of the zeaxanthin analogue, diatoxanthin. Addition of the uncoupler NH4Cl before illumination can completely abolish formation of NPQ, revealing the ΔpH-dependency of the xanthophyll cycle activity. Once established, NPQ can also be almost completely reversed by the uncoupler. However, the higher NPQ is formed the more time is required for its reversal. At the point when the fluorescence was approximately 90% recovered the level of illumination-induced diatoxanthin was found to be only partially reduced. This indicates that the proton gradient is a key triggering factor of NPQ. It was also noticed that NPQ in Phaeodactylum cells was absent even when majority of reaction centers were closed and the plastoquinone pool was significantly reduced. The absence of NPQ at these conditions could be due to very low levels of ΔpH. It is likely that in diatoms alternative sources of protons such as the PS I cyclic electron transfer and/or chlororespiration are important in generating the proton gradient sufficient to trigger NPQ. Absorption changes associated with the xanthophyll cycle activity were found to be larger than those for higher plants. The position of the positive maximum in the difference spectrum illuminated-minus-dark was 512–514 nm in comparison to the 505–508 nm for leaves. The 535 nm band associated with NPQ in plants is absent in Phaeodactylum. An uncoupler-sensitive absorption change at 522 nm was discovered. Kinetics of NPQ showed linear correlation with the 522 nm absorption change.